Chocolate bunnies and eggs are delicious, but they can also be deadly in high amounts to our pets. Here are a few tips to keep your pets safe during Easter weekend. WASHINGTON – Easter weekend and the week after is a busy time for emergency veterinarians because, as with many holidays, people tend to bring things into their homes that are dangerous for pets. Here are a few tips for keeping your pets safe this holiday! Those chocolate bunnies, chocolate eggs and chocolate kisses are all delicious, and definitely cute, but they can also be deadly in high enough amounts to our pets. Signs of chocolate toxicity can range from mild stomach upset, to tremors, seizures and even death. While dark chocolate is the worst — it has the highest concentration of methylxanthines, the toxic property of chocolate — all chocolates can be toxic. You might think you’re going the lower calorie route by choosing sugar-free gums, candies or sweetener packets. However, did you know that sugar-free products are often sweetened with a compound called xylitol that can cause severe hypoglycemia and liver failure in pets? Keep these products as far away from your pets as possible to keep them safe. Many popular house plants can be toxic to our pets (for a full list check out the ASPCA’s list of toxic plants), and many Easter favorites appear on that list. Flowers in the Lily family can be especially toxic to cats, who love to nibble on their leaves and petals. Signs of toxicity can be a lack of appetite, vomiting, diarrhea, yellowing of the skin and more. To protect your pets, keep these plants completely out of your home. It’s so much fun to dye eggs with the kiddos, and seeing them run around hunting them on a lovely Easter morning is very sweet. However, a few days later, when those unfound eggs are rotting in the backyard, it could mean a trip to the veterinarian. Make sure you count the eggs that you’ve dyed and hidden, so that all are present and accounted for at the end of the day. While a rotten egg is not toxic, it can be very upsetting to your pet’s gastrointestinal tract. That shiny pink, green and yellow plastic “grass” that you use to cushion the eggs in your kids’ Easter baskets can be very tempting to cats. Cats love stringy stuff, and they tend to chew and ingest it. Imagine how the string in the waistband of a pair of sweatpants works to cinch up that waistband. Well, imagine a string in the intestine of a kitty doing the same thing. 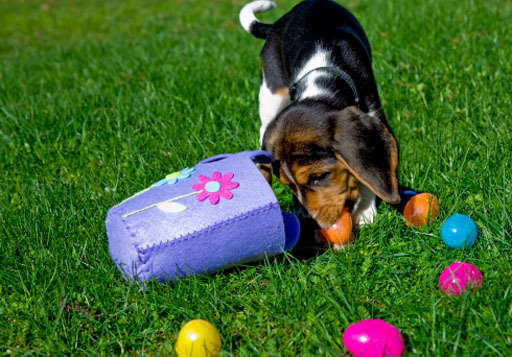 The effects can be life-threatening, and deadly without surgery to remove it, so if you have cats (or dogs that tend to chew), try using shredded paper or some other cushion in the Easter basket to eliminate this as a problem. Obviously, guests are not toxic to our pets, but they can bring their own set of issues. As with any holiday, advise guests entering your home about the idiosyncrasies of your pets. If your pets tend to crowd the door, make sure guests know to close all exits quickly and securely. If your pets tend to raid suitcases or handbags, make sure your guests zip them closed and keep all foods, dirty clothes and medications completely inaccessible. Also, protect your guests if you have pets that tend to get nervous and nip. The last thing you want on Easter Sunday is to have to leave to go either to the veterinary or human emergency room.